I'm not operating on a policy of relentlessly reviewing the Unbeatable Squirrel Girl issue-by-issue. Reading it, sure - I love every reliable delivery of sassy all-ages fun. It doesn't usually require critical attention, though. But when the Mighty Marvel Marketing Machine tells me that the War of the Realms is bringing Doreen into her first-ever Big Dumb Event™ tie-in? I reckon that's worth a closer look, even if I wind up doing yet another consecutive Squirrel-review! Doreen and her supporting cast take a Negative Zone vacation to visit her "mad science duplicate not a clone" Allene. Marvel narratives being what they are, they just happen to do this on the day the War of the Realms arrives in Midgard. Doreen is teleported back to New York so that Loki can send her on an Important Mission to fight Frost Giants in her native Canada. First, though, he gives her an impressively broad introduction to the War of the Realms. It takes a lot of pages and a lot of words to cover those developments, but the pace picks up tremendously once Doreen reaches Canada. It's surprise guest stars galore - including Doreen's mom and dad - as she gets down to Giant-fighting business. 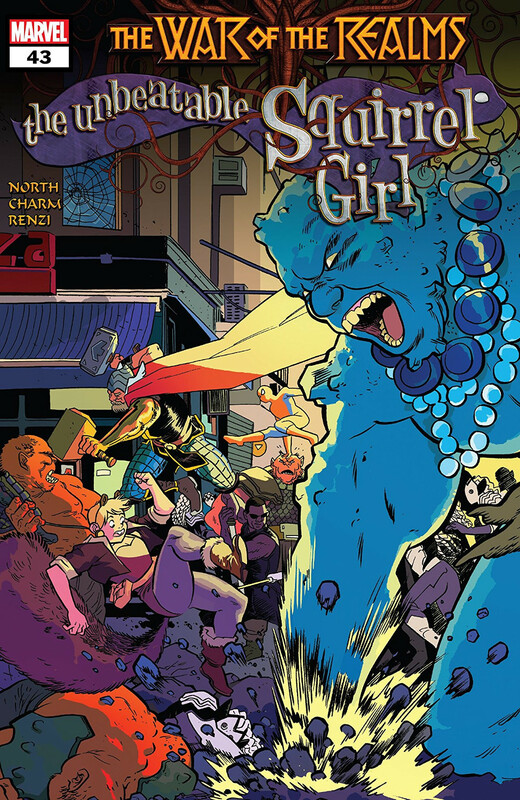 This issue dives deep into Squirrel Girl's backstory, making sound use of all her Asgardian connections as well as a few more left-field callbacks. The final act is stuffed with surprises that unfold in the best possible way - impossible to see coming, but eminently logical once they're revealed. This is also a really impressive issue visually. Characters, settings, and outfits are drawn from a literally multiversal palette, and all of them emerge with clarity, appeal, and humour. Rico Renzi's colours are similarly diverse. They mostly stick to the title's established, cartoony style, but Loki's scene employs a surprisingly wide and successful range of shading techniques. Derek Charm works hard to enliven that long Loki conversation by packing the background with hilarious peeks at the War in New York. He also tackles the inherent perspective challenges of Squirrel Girl fighting Frost Giants with engaging inventiveness. He builds a brilliant semi-splash page out of a Giant's-eye view of Doreen climbing her opponent. While the storytelling and characterization get pretty heavy (and, admittedly, slow) in the first act, Ryan North loads plenty of humour and cleverness into the script. And the heaviness serves an excellent purpose; this issue bids a surprisingly emotional farewell to Loki. There are also impressive mysteries woven subtly into the plot. A careful reading gives me plenty of compelling questions to carry forward into subsequent issues, and I think the odds of getting satisfying answers for them is extremely high. Most of the questions aren't easy to discuss without spoilers, but I can drop one very basic one from the first scene: Surely Allene is going to come back into the story in a plot-relevant way, right? That's like "Chekov's Gun 101" stuff! Unbeatable Squirrel Girl #43 delivers a wordy introduction to the War of the Realms, says a heartfelt goodbye to Loki, and then boots Doreen into Asgardian/Canadian trouble right up to her squirrel ears. It's funny and it's fascinating, and it's an already-great start to what looks like a great tie-in.